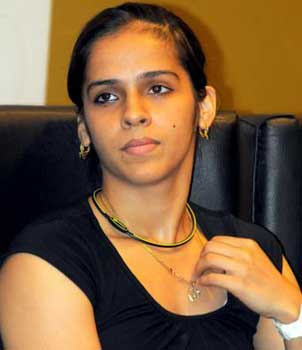 Saina Nehwal born March 17, 1990 is an Indian Khel Ratna badminton player currently ranked number 4 in the world by Badminton World Federation.Saina is the first Indian woman to reach the singles quarterfinals at the Olympics and the first Indian to win the World Junior Badminton Championships. Saina Nehwal made history on June 21, 2009, becoming the first Indian to win a Super Series tournament, by clinching the Indonesia Open with a stunning victory over higher-ranked Chinese Wang Lin in Jakarta. Saina won her second career Super Series title by winning the Singapore Open title on June 20, 2010. She completed a hat-trick in the same year by winning the Indonesian Open on June 27, 2010. This win resulted in her rise to 3rd ranking and subsequently to No. 2. Later in the same year she also won Hong Kong Super Series on December 12, 2010.